Welcome to River Bend YMCA Golf Course! 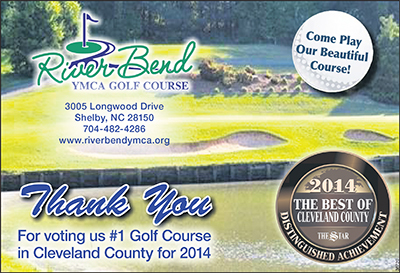 River Bend YMCA Golf Course is ideal for anyone with a passion for challenging golf and spectacular scenery. This course is the perfect setting for any corporate or community golf event. Our 18 hole gem is nestled in the scenically beautiful North Carolina foothills and has characteristics of a mountain layout. River Bend features well-conditioned MiniVerde greens and Bermuda fairways. Take a look at our Daily Specials and Rates pages for price information. We invite you to join us for a round of golf soon! To positively impact the lives of young people by providing learning facilities and educational programs that promote character development and life enhancing values through the game of golf. Copyright © 2019 River Bend YMCA Golf Course All Rights Reserved.